A student at the University of New Brunswick has designed a new circuit technique for a wide range of electronic devices that could dramatically cut the size of circuits, leading to devices that are both faster and consume less power. 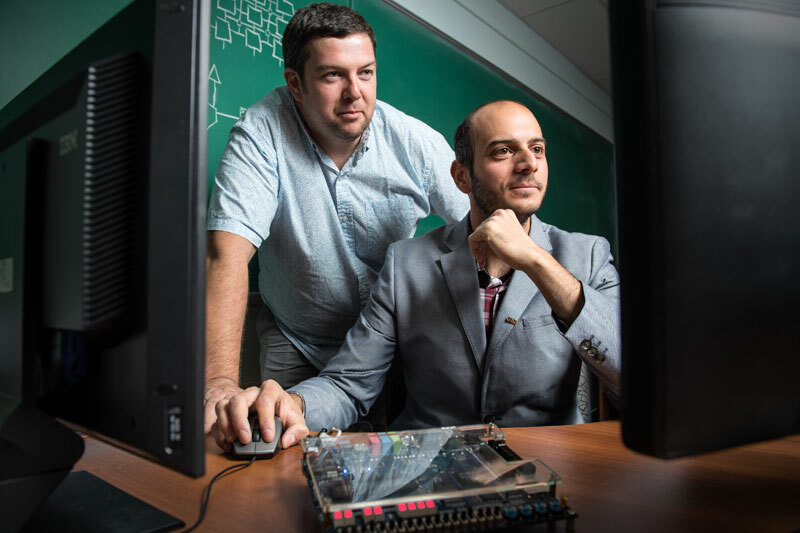 Panagiotis Patros, a Phd student in Fredericton, has been been travelling to expos and conferences in the United States and Canada to showcase his new design in the hopes it will be embraced by colleagues as well as chip makers. “This can definitely make chips faster. It can definitely make them smaller, and as a result, that means that they can consume less power. And if they can consume less power, it means that first of all it’s cheaper to maintain, it has less chance to be faulty. It also means it has a longer lifespan,” Mr. Patros says. With the help of supervisor Kenneth Kent, a professor with UNB’s faculty of computer science in Fredericton, he is optimizing the performance of digital circuits. This week, Mr. Patros presented his research at the TEXPO Graduate Student Competition and Exposition in Montreal. Earlier in October, he was in Pittsburgh presenting his work as a paper at the 27th International Symposium on Rapid System Prototyping. Originally from Athens, Greece, he came to UNB in 2012 on a full scholarship to complete his master’s degree in computer science. His unique idea to slash the size by automatically removing reset circuitry came to life as a result of a project for Dr. Kent’s course in embedded systems. It was the strong collaboration he enjoyed with Dr. Kent and others at the faculty of computer science, his fondness for Fredericton and continued funding by the IBM Centre for Advanced Studies at UNB that inspired Mr. Patros to stay at UNB to pursue his PhD. While this technology is in the preliminary stages of development, Mr. Patros and Dr. Kent are moving forward expanding their work by exploring how this new technology could be adapted for older devices and beginning the publishing process. Dr. Kent joined UNB’s faculty of computer science in 2002 and serves as the head of the Reconfigurable Computing Group and director of the IBM Centre for Advanced Studies – Atlantic. His research interests include hardware/software co-design, reconfigurable computing, embedded systems and software engineering. Dr. Kent was recently awarded the 2016 University Research Scholar award.